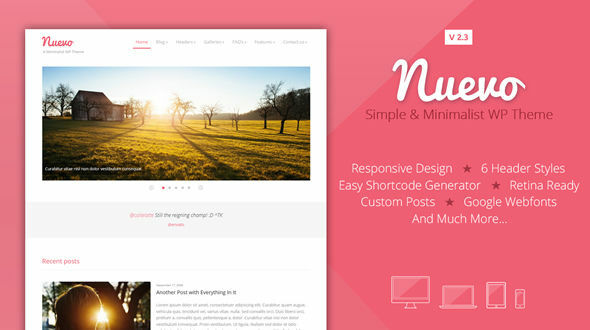 Nuevo is a full responsive multipurpose theme so you can use it in any blog with the powefull panel we already included. With a minimalistic and clean design, Nuevo always looks good on any device. HTML5 & CSS3 ready, IE8 fallback. XML Demo Content Included (2 minutes installation). Post formats: standard, video, audio, gallery (slider style). SEO optimized and SEO options. - Important fix: nav menu page was not saving the correct order of menu. - Minor improvement on submenu animation. - Minor Fix: incorrect wordpress caption width and margin. - Minor fix: now fancybox lightbox will not scroll to the top of the page. - Important Update: now font-size selector (ep shortcodes) works with nouislider. - Now ep shortcodes tabs looks good on small screens. - Fixed incorrect placements when using floating elements inside an article. - Important Fix: now customizer on wp-admin works properly. - Theme options panel updated from 3.1.9 to 3.2.9. - Important Fix on WP 3.9: shortcode generator not showing the icon/glyphs dropdown list properly. - Minor fix: gallery filter now supports special characters. - *New option: now image logo supports custom width and height. - *New option: now the blog description (tagline) can be disabled. - *New feature: galleries shortocode can filter by specific categories. - Improvement: now the user can add multiples galleries shortcode in one page with different categories. - Important Fix: retina display function will load inside the header.php and not on WP init, to avoid some minor warnings in php. This fix will improve the website speed. - Minor fix to google map shortcode. - Now the Google Maps shortcode supports Map type. - Fixed incorrect margin on google map shortcode. - Important Update: now the homepage by default show the latest post (like the blog classic layout). - Important Update: now is clearly explained how to set the custom home page template, just check out the documentation. - Update to theme options panel 3.1.9 (better look and performance). - New option to disable recent post on homepage. - Fixed incorrect language attribute on IE 9. - Fixed facebook share button on IE9. - Fixed telephone an email order on contact form. - Home latest post will show the current gallery or video like blog template. - Home recent posts now display a small icon indicating the current format. - *Major structural changes to: blog, categories, archives and search. - All documentation updated. - Demo data updated. - Fix: 404 page not showing return to blog page link. - Fix: now Icon column support select2. - Fix: Google maps not rendering the close button properly. - Fix: author layout #1 not rendering the correct width. - Fix: incorrect placement of border when left sidebar layout is selected. - Added a white background to search input(footer) when boxed layout is selected. - Fixed pagination issue when the blog pagetemplate is set as homepage. - Fixed font rendering on Safari. - Fixed a minor submenu delay on Safari. - Fixed the lightbox shortcode generator height (not showing the map shortcode on small screens). - CSS 3 effects improvements. - Minor changes to the ajax contact form (functions.php). - Minor changes to customizer. - Minor Changes to online documentation (major readability).